If the targetSdkVersion is lower than 23 then the standard permissions system will be used on all devices including Android 6+, however soon all Google Play apps will need to set the targetSdkVersion to 26+. B4A v6.0 adds support for runtime permissions. The nice thing about runtime permissions is that the user is not asked for any permission when they install your application from Google Play. Instead they will be asked to approve "dangerous" permissions at runtime. RuntimePermissions.CheckAndRequest is the key method. CheckAndRequest is not a blocking method. The program flow will continue and only later Activity_PermissionsResult will be raised. The CheckAndRequest method can only be called from an Activity. There is another method named Check that only tests whether the permission has already been approved or not. This method can be called from any module. It might be tempting to first test whether there is a permission and only if there is no permission call CheckAndRequest. However it will just make the program flow more complicated as you will need to deal with all cases anyway. As a general rule, you shouldn't call RuntimePermissions.Check from an Activity. It will be simpler to always call CheckAndRequest. The dangerous permissions are marked with * (in B4A v6+). You don't need to ask for non-dangerous permissions. This is the most common dangerous permission. It is added automatically when you use File.DirDefaultExternal or File.DirRootExternal. However there is a simple workaround for this. 1. Use RuntimePermissions.GetSafeDirDefaultExternal("") instead of File.DirDefaultExternal. The parameter passed is an optional subfolder that will be created under the default folder. The explanation for this is that GetSafeDirDefaultExternal doesn't require any permission on Android 4.4+ (API 19) and requires the WRITE_EXTERNAL_STORAGE on older versions. The code above adds the permission to older devices. You only need to deal with WRITE_EXTERNAL_STORAGE at runtime if you need access to a folder other than the app's default external folder. - You can only request permissions that were declared in the manifest file (this is usually taken care by the compiler). - Testing the permissions can be confusing as the user only needs to give permissions once. The solution is to uninstall the app from the device. Click on Ctrl + P (clean project) in the IDE and run again. - The user actually approves groups of permissions. So if the user has approved the read contacts permission they will not be asked to approve the write contacts permission. - Once you've uploaded your app to Google Play with targetSdkVersion set to 23 you cannot downgrade the target version back. 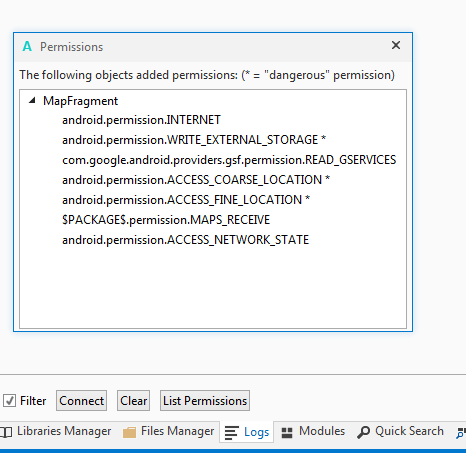 - Some Android 4.4 (API 19) devices do not allow access to RuntimePermissions.GetSafeDirDefaultExternal without explicit permission although they should. It it therefore recommended to set android:maxSdkVersion to 19 in the version based permission. It was previously set to 18. GMan, lordjuergen, stingrae and 19 others like this. When should we expect B4A ? Thanks again for your support . As this is a tutorial please start a new thread for any unrelated question (BTW, my Android device run Android 7.0 ). ilan, MarcoRome, Cableguy and 1 other person like this. hi @Erel, once the user has accepted the permission will he be asked again when the next time the app will perform the same task? is it possible to request multiple permissions at once ? Check and CheckAndRequest accept string, is it possible tp pass an array or a list ? You can call CheckAndRequest multiple times. The permissions are always presented separately to the user. when i uncheck again runtime permission it works so there is a conflict between both libs. thanx i will do that! I'm trying to manage permissions in app´s and I started with the example of this tutorial. I do not get it to work and I do not understand where the problem is. I attached the zip program to see if you can help me find the solution. Please start a new thread in the questions forum. Have you copy android-support-v4.jar into b4a libraries from sdk? yes copyed from my sdk folder "D:\Android\android-sdk\extras\android\support\v4"
How can I request for permission SYSTEM_ALERT_WINDOW (Draw over other apps) ? It's not exist in RuntimePermissions. Did you get an error when you set targetSdkVersion to 23? I want to check if permission "Draw on top" is not accepted, it will call "Draw over other apps" setting like image below.